A rare delight in US aviation is that Virgin America still offer free tea, coffee and soft drinks in the economy cabin (called 'Main Cabin'). In Premium Economy (called Main Cabin Select) all drinks are free – but to make the most of your flight, you need to order it quickly as soon as you can, via the online ordering system which is part of the IFE. 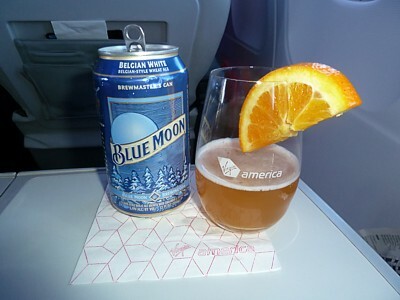 In First Class, there are plenty of free drinks: beer, wine or spirits plus mixers are brought to your seat, and you will often get a pre-flight drink too. Beware if you order the House White or Red from Virgin America. That's exactly what you'll get. Wente Vineyards is a winery in Livermore, California and holds the distinction of being the oldest continuously operating, family-owned winery in California. Which makes it all the more odd that they would produce this stuff. It's the sort of dull, easy-drinking 'soft white' you expect if you order a house white. It has no particular flavours, no noticable overtones. It is exactly what it says on the tin. Alcoholic grape juice. Its the same for the Wente Vineyards house red. I mean it's easy drining stuff - on the way to LAX from JFK you could probably drink this like fruit juice, and so long as you didn't want to stand up at the end, it would be fine. However there's one thing missing with the flavour: anything at all. It really is quite unremarkable. 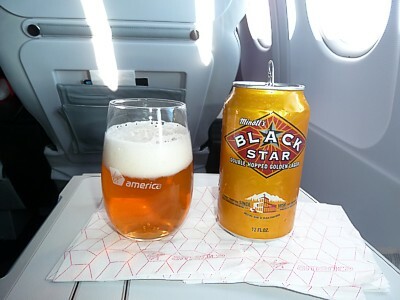 And average easy-drinking lager, Black Star is a double-hopped golden lager made by the Great Northern Brewing Company in Whitefish, Montana. It is based on traditional European Pilsners, and made with two-row malted barley. Black Star contains 20% Bavarian Mittelfruh and 80% Czech Saaz hops. A real local brew, the Great Northern Brewing Company is built in a traditional gravity flow arrangement. This is a typical cloudy wheat beer, but it is unusual to find on an aeroplane. The beer is orange-amber in colour with a cloudy appearance because it is unfiltered. Blue Moon has a more pronounced orange flavor than many other beers of the style, and also has a slightly sweet flavour.